FUNNVILLE - The Richmond Flying Squirrels are hosting a Caturday Festival on Saturday, April 6 during which the team will wear special jerseys featuring one of three cats available for adoption at the Richmond SPCA, the club announced Monday. The jerseys will be auctioned during the game with proceeds benefiting the Richmond SPCA. The team, in partnership with radio station Mix 98.1, is asking fans to vote on which cat they would like to see featured on the Caturday jerseys. Fans can click here to vote for their favorite jersey design now through Wednesday, January 30. The winner will be announced by Mix 98.1's Kat Simons on Thursday, January 31. "We look forward to saluting our feline friends this season to find good forever homes for cats in need," Flying Squirrels VP & COO Todd "Parney" Parnell said. "We are also excited to support and partner with the Richmond SPCA, who does such a great job in our community." 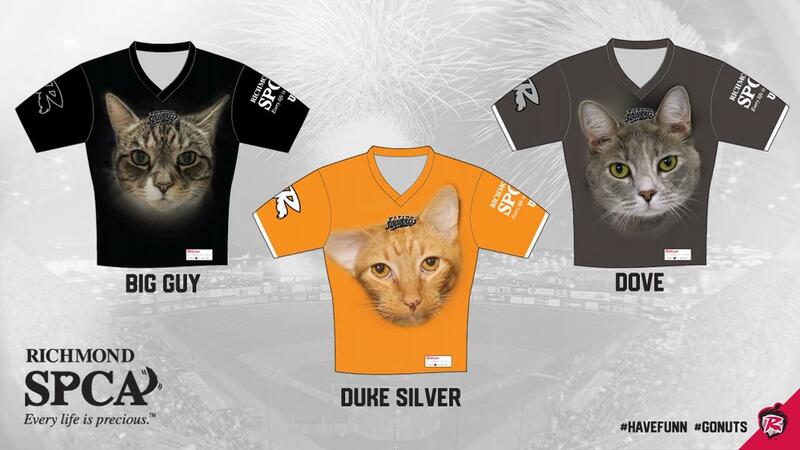 The three cats featured on the jersey designs are named Big Guy (black jersey), Dove (dark gray jersey) and Duke Silver (orange jersey) and all have been long-term residents at the Richmond SPCA. Dove was recently adopted, but Big Guy and Duke Silver are still available for adoption. In an effort to find the animals a new home, the Flying Squirrels are offering a baseball season's supply of kitty litter, two Field Level tickets to Caturday featuring postgame fireworks and an opportunity to throw out a ceremonial first pitch to anyone who adopts either Big Guy or Duke Silver before Opening Day, April 4. Big Guy is eight years old and was transferred into the care of the Richmond SPCA from Hanover County Animal Control in May 2016. He is a favorite of the Richmond SPCA staff and can often be found sleeping in the office of the two employees with whom he shares the space. Big Guy likes to eat and is currently on a diet. He can also be spotted at times going for a stroll around the neighborhood in his cat harness and leash. Dove was recently adopted on Wednesday, January 23. The three-year-old had been cared for by the Richmond SPCA since October 2018 when she was transferred from Prince George Animal Shelter. Dove is a bit shy around new friends and prefers to take things slow, but she has been known to give little forehead kisses to her very best friends. Duke Silver is six years old and was transferred into the care of the Richmond SPCA from Henrico County Animal Shelter. He had surgery performed on his ear to remove some uncomfortable lumps, which gives him extra swagger. Duke Silver was born, it appears, to yammer away and delve deep into many a debate (he's talkative). If you sit down next to him, he will not leave your side. He is a feline that inherited a gritty determination to win you over in one fell swoop. Additional details about Caturday will be released at a later date along with the rest of the Flying Squirrels' 2019 promotional schedule.